Banish your winter blues with this stunning balsamic chicken strawberry salad! 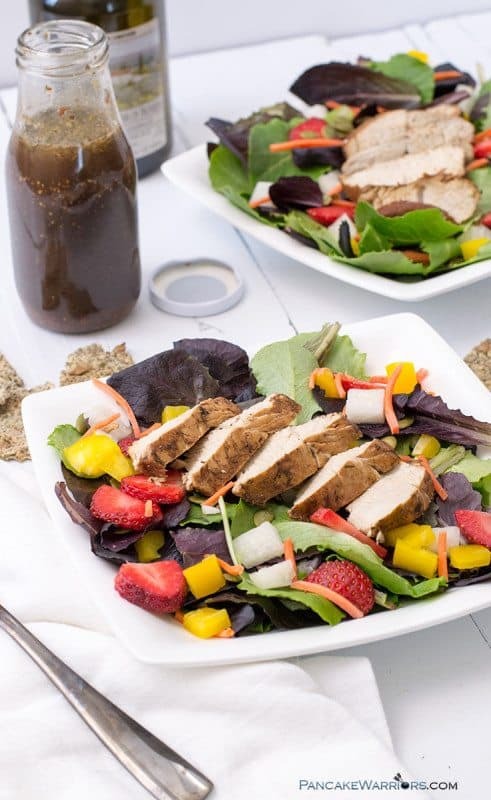 Perfect for brunch, lunch or dinner, this salad is topped with balsamic chicken, strawberries, jicama†and homemade balsamic dressing. You will have a fresh, healthy salad that is bursting with flavor and is anything but boring. Spring is the best time of the year (minus the allergies of course). North Carolina (where I’m from and Jenny now lives) is notorious for getting warm really quick. We go from winter to summer what seems like overnight. Luckily that means that we get to pick fresh strawberries pretty early in the year as well. And there is nothing better than freshly picked strawberries (especially if you have some freshly whipped coconut cream to dip them in). And I like to add fresh strawberries to everything after missing them all winter long! Many of us think salads and we are instantly thinking about all the toppings we can add to make it more appealing. I’m guilty of this too. Give me all the goat cheese, candied pecans and dried cranberries. But beach season is coming up quickly, so instead I opted for some lighter, though just as filling toppings. Fresh strawberries, jimaca and shredded carrots all add crunch, texture and a bit of sweetness to the dish. 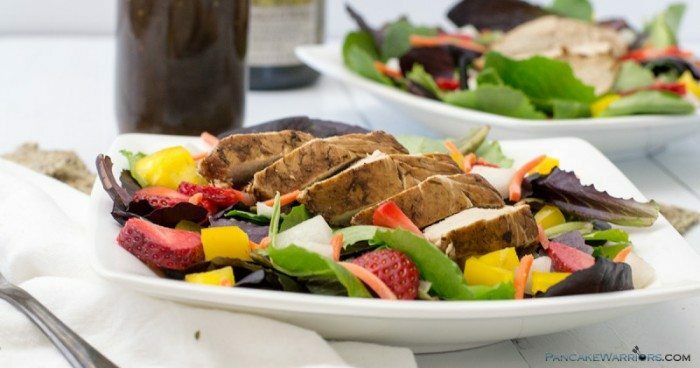 Paired with balsamic chicken, this salad is guaranteed good eats! I promise you won’t even miss those other toppings! †If you really need to add something to your salad, try making your own crackers! My favorites of hemp almond flax crackers and pumpkin sunflower seed crackers! So easy and so good! Do you make your own dressing at home? I used to be pretty intimidated at the idea of making homemade dressing, both because I thought it would be a ton of work but also I thought it was too many calories! I had no idea that the fat free or low fat dressing in the grocery store was loaded with sugar and artificial ingredients, turning my salad into a big sugar bomb! Instead I just focused on the number of calories and thought I was doing well. Since then I realize that I was doing myself a huge disservice! You need those healthy fats (from olive oil, avocado, nuts and seeds) in order to help you absorb all those amazing vitamins from your salad. Not only that but healthy fats are responsible for helping regulate your hormones, give you glowing skin and nails and help keep you feeling full and satisfied instead of starving and ravenous (the way I used to feel after eating a salad with fat free dressing). So now I know about those healthy fats, I always make my own salad dressing at home, and it’s really so easy. I don’t even stir, I just put a lid on my dressing and shake it vigorously. The trick is to add just a little bit of mustard to the dressing, as this has a natural emulsifier in in (which is what helps thicken the dressing and the oil and the vinegar to bind together). 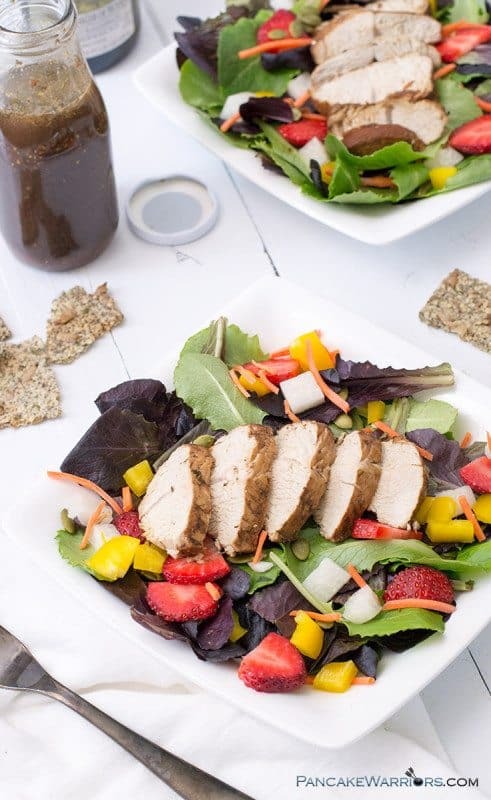 My other favorite dressings to make at home besides this easy balsamic vinaigrette is this creamy avocado cilantro dressing and this maple tahini dressing. Both are so good and so simple! I promise you with these simple homemade dressings your salads will never be boring and you will never have to worry about preservatives, unnecessary sugars or chemicals and you will always get a healthy dose of heart healthy fats to keep your skin radiant and your tummy full! Have you ever made a balsamic reduction? If so you will know the balsamic vinegar gets super sweet the more you cook it. But the downside is that it can also burn quickly from the natural sugars in the balsamic vinegar. So it’s important when you use balsamic vinegar in a marinade you protect your protein from getting burned. In this recipe you will notice that we add water and almost allow the chicken to poach. If you don’t have time to “watch” the chicken to ensure the balsamic doesn’t start burning, you can skip the marinade and instead add the marinade ingredients to a small sauce pan and put them over medium low heat for 5-6 minutes until reduced in half. Remove from heat and then pour over the chicken once done cooking on the stove. 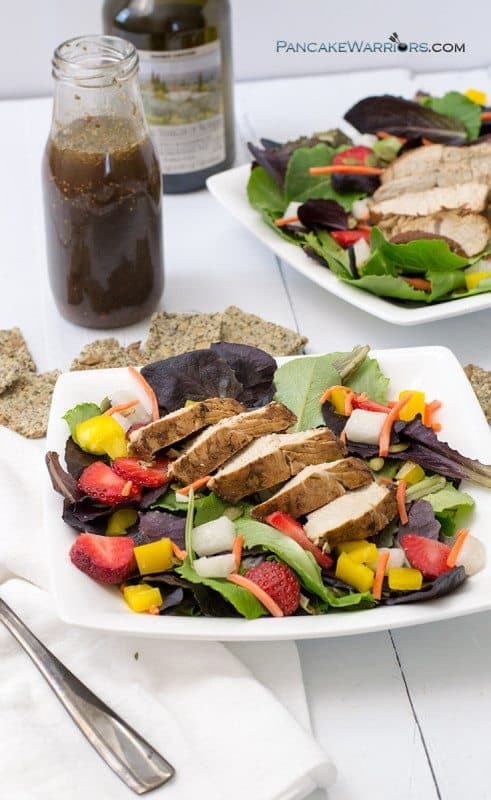 Either way you will get the benefits of the super sweet balsamic vinegar reduction! Check out some of my favorite ways to enjoy reduced balsamic vinegar with this healthy tomato avocado salad with reduced balsamic or this roasted beet salad with reduced balsamic. 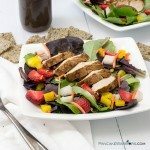 Try this fresh balsamic chicken strawberry salad for lunch or dinner this week! So simple to make, gluten free, grain free and packed with protein, fiber and healthy fats! Combine the ingredients for the chicken (except for the chicken) in a small bowl. Place the chicken in container with a flat bottom and a lid (I used a large pyrex glass bowl) and pour the marinade over the chicken. Cover well and flip so both sides are coated. Cover and refrigerate 15 minutes. After done marinating, place a medium skillet (that has a light fitting lid) over medium heat. Let the skillet get hot then add non-stick spray (I used coconut oil spray) and quickly add the chicken, breast side down. Let cook 4 minutes. Flip the chicken and add 1/4 cup water immediately. You will notice that the balsamic wants to burn if you don't add water. Cover the skillet and keep an eye on it. You will likely need to add another 1/4 cup of water about 10 minutes into the cooking process. After 15 minutes, remove the lid and allow the sauce to cook down 1 minute (you have now cooked the chicken a total of 20 minutes). Check the internal temperature or cut through the thickest part of the breast. Temperature should be 165F and you should not be able to see any pink in the chicken. Take off the heat if it 's done cooking and allow to cool slightly. Cut the chicken on a bias (angle) so it presents well on the salad. Chop the veggies and the strawberries (while the chicken is cooking). Assemble the salads. In a small container (with a tight fitting lid) add all the ingredients for the balsamic vinaigrette. Place the lid on the container and shake vigorously. Taste and add another pinch of salt or another splash of vinaigrette as needed.